The history of medicine is a dynamic international field of study focusing on the different ways that bodies and minds have been investigated and understood. Participants learn to situate medical knowledge in the time and culture where it was produced, and in this way to appreciate the interaction between science and society in the past and in the present. Students come from a broad range of disciplines, bringing an array of perspectives, as historians or physicians in training, for example, and/or former patients or caregivers to others. This mix of experiences and expertise in the classroom offers the opportunity to compare and contrast worldviews, to challenge assumptions, and to critically reflect on issues of great significance, from birth to death. The MA track in Medical History is an interdisciplinary program taught in English, that is jointly offered by the Faculties of Humanities of the Vrije Universiteit in Amsterdam and the University of Amsterdam, and by the Faculties of Medicine of the Universities of Maastricht, Amsterdam and Rotterdam. Sessions are led by scholars from universities around the country, as well as those involved in medical history in other venues, including online and in museums. The track is open to students of History, Health Sciences, Medicine, Pharmacy, and Social Sciences at any of these universities as well as to international students. Courses run annually from February through June and are taught in English. Most course sessions are located at the Vrije Universiteit in Amsterdam, with some held at museums or archives in other towns, all easily accessible by train. Students can take one or both of the courses of the Basic Program: INTRODUCTION TO MEDICAL HISTORY 1 – UNTIL 1850 and INTRODUCTION TO MEDICAL HISTORY 2 – SINCE 1850. 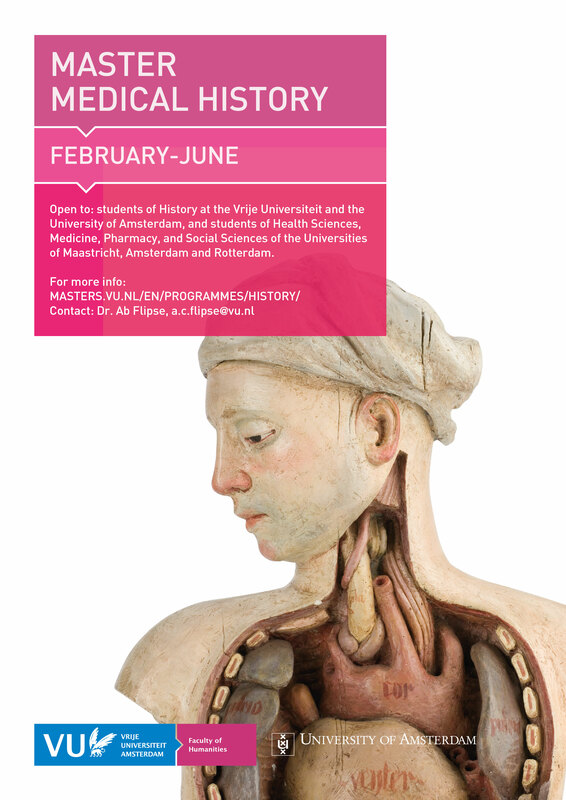 These courses offer a thematic-chronological survey of the history of medicine from Classical Antiquity to 1850 (COURSE 1) and from 1850 to today (COURSE 2), enabling students to understand how beliefs and practices reflect their historical and cultural contexts. Sessions explore changing concepts of health and illness and the diverse marketplace of remedies and advice. Seminars are given by professors and scholars from universities around the country as well as other those involved in medical history in other venues, including online and in museums. Developments within medicine are approached as socio-cultural phenomena, and students are also encouraged to consider how existing histories reflect and inform contemporary debates. The seminars aim to develop the interdisciplinary abilities of participating students and prepare them for independent research. Students can then take one or both courses of the subsequent Research Training Program: RESEARCH SEMINAR 1: DOING RESEARCH and RESEARCH SEMINAR 2: MEDICINE IN SOCIETY. RESEARCH SEMINAR 1: DOING RESEARCH, provides training in methodological aspects and research techniques of the history of medicine, with particular attention to strategies for locating and interpreting primary sources, in libraries, archives, and museums. The course develops students’ ability to design and conduct interdisciplinary research in an independent research project of their own choosing. Seminar sessions address key strategies for defining a research focus, locating relevant primary source materials, and methods of source analysis. Professors and scholars from various universities and institutions address common characteristics of archives and museum collections, such as the “medical gaze” and the absence of patient perspectives. They then explain techniques for enriching the analysis of traditional sources as well as ways to bring in new perspectives by focusing, for example, on oral histories, museum objects, or emotions and senses. RESEARCH SEMINAR 2: MEDICINE IN SOCIETY engages with new approaches to the history of medicine. The course develops students’ ability to design and conduct interdisciplinary research in an independent research project of their own choosing, to critically evaluate existing historical scholarship in the field, and to consider the impact of emerging trends on our interpretation of the past. Medical theories and practices reflect the society in which they were formed as well as reshaping the world around them. In this seminar, this dynamic relationship between medicine and society is examined through a focus on the most innovative and exciting new approaches emerging in the field of medical history. An international group of professors and scholars from universities and institutions around the country will discuss their own work and the implications of their projects for the interpreting the past. How does our understanding of the history of medicine shift when we combine the different perspectives of healthcare practitioners and patients, for example? What can we learn when we examine local public health issues in broader global contexts, from international drug trades and the treatment of addiction to emerging infectious diseases and public health surveillance and quarantine? The Basic Program (INTRODUCTION TO MEDICAL HISTORY 1 – UNTIL 1850 and INTRODUCTION TO MEDICAL HISTORY 2 – SINCE 1850) is rounded off with a small exam and an individual paper in which the historiography of a specific medical-historical theme is presented and discussed. Students who have participated in only one of the two courses will present a paper with a maximum of 2.000 words. Students who have taken both courses will present a paper of not more than 3.000 words. Participants who take both courses of the subsequent Research Training Program (RESEARCH SEMINAR 1: DOING RESEARCH and RESEARCH SEMINAR 2: MEDICINE IN SOCIETY) are expected to conclude this part of the master track with a paper of at least 15.000 words. Students who have taken only one of the two courses will compose a paper of at least 7.500 words. These papers need to be based on an original problem and research question or hypothesis. Both problem and research question are based on sound historiographical investigation. Individually, each participant formulates a first draft of his or her research plan. The final formulation is then drawn up in close consultation with the coordinator and the core staff. In the course of the Research Training Program each participant receives individual coaching from a staff member. Participants who have already registered as regular students at a Dutch university need to register at VU as so-called bijvakstudent (see https://www.vu.nl/nl/opleidingen/toelating-en-inschrijving/bijvakken/index.aspx). Students of medicine of the UMC Maastricht, UMC Nijmegen, LUMC and VUMC can take the whole track as scientific practical. Please contact the coordinator of the track for further information. Students from other countries than the Netherlands and who are not already registered at a Dutch university are also requested to contact the coordinator.